This Whitepaper will examine how you can become a knowledgeable advocate for AI. With AI marketing solutions promising to increase work efficiency and ROI, why are so many companies still resisting adoption? And what can you do push your company across the AI threshold? 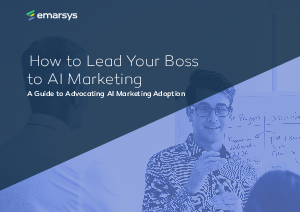 Address misconceptions your VPs and C-level leaders may have about AI-enabled technology with this free guide that offers tactical advice on how to approach them to recommend AI marketing for your company.